Compact size – enables using the instrument at places where the space is limited. A short length fits even narrow and winding pipes of a short diameter. The minimal hole’s diameter is 125 mm. Solid and robust frame – made of cast aluminium. An implemented vibrations compensator absorbs vibrations from outside. Automatic double compensation system – ensures quick tilt stabilization of the transversal axes within the range of do 10° on both sides of the instrument. Automatic target finding – an active target plate with a "target-find" function. It automatically places the laser’s beam QL 125 in the plate’s centre. Alternatively, any target plate can be applied. 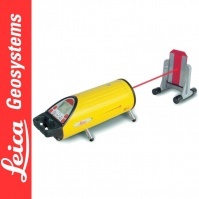 The laser is supplied with a remote control that is able to move the laser’s beam to any direction. Additional rotating beam in QL 125 – it determines a vertical accurately at the direction of the laser’s beam. 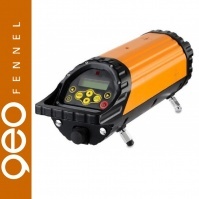 A standard laser beam of a pipe level determines the direction and inclination only with a single laser’s point. Clear display – ensures easy readings. Large and clear signs makes using the instrument easy. The illuminated display enables results reading even in darkness. Water-resistance - IP68 protection makes the frame dust- and water-resistant. Versatile configuration – legs, which can be changed if needed, enable fitting the instruments at the following heights: 150 mm, 200 mm, 250 mm. The target plate does not require any additional things. Manual alignment of cross axes – with a digital level on the display. In case of automatic levelling, the user is warned of leaving the levelling range by a pulsating laser beam. 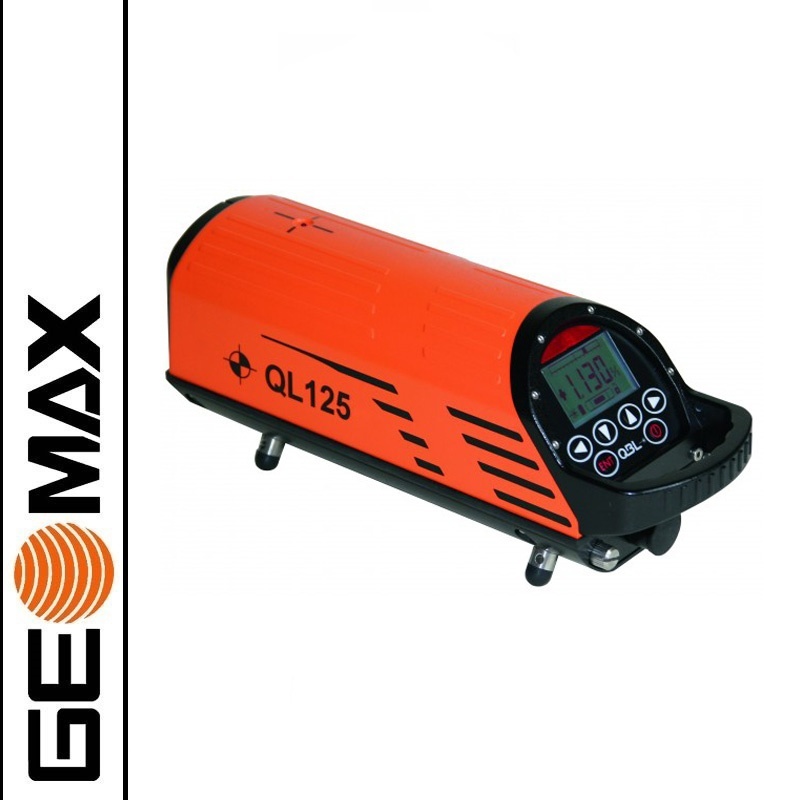 Lithium-ion batteries - makes QL 125 always ready to work. The second battery (optional) can be charged outside the instrument. 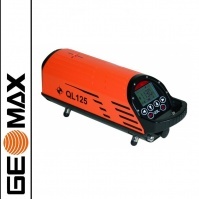 The laser QL 125 can still be used, even if the battery is charged inside. Handy remote control – with the range of 100 m. All important functions can be controlled with the remote. The stand-by mode is especially useful during breaks at work. Manual settings – enables setting functions and laser’s direction outside the work place. 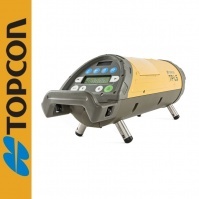 Therefore, the instrument can be set in a comfortable space and then placed in the work place without the necessity to reset the settings and parameters. Accuracy – pipe laying requires high accuracy over long distances. 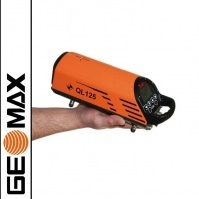 QL 125 offers the accuracy of 0,001%. 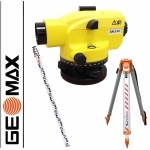 A reliable and precise optics and electronic mechanisms, designed to work in nard conditions, ensure such accuracy. Inclination angle - QL 125 proves itself in land and sea engineering within the range from -15% to +45%. Rotation point 5/8" thread – a bright LED indicator on the top indicates the rotation axis. The 5/8’’ at the bottom is also placed at the rotation point.